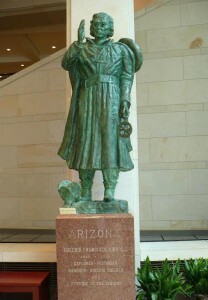 On February 14th 1965, in the “National Hall of Statuary” in Washington D.C., the young State of Arizona, part of the US since 1912, enjoyed a day of grand celebration. 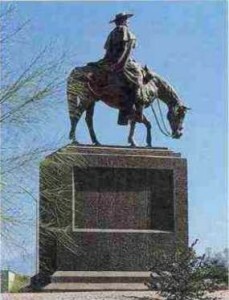 A statue of Eusebio Francisco Kino, a pioneer founder of the State was dedicated in the Capitol Building of the stars and stripes republic, next to those of the most renowned personalities in the history of the United States of America: George Washington, Samuel Adams, Sam Houston, Andrew Jackson. 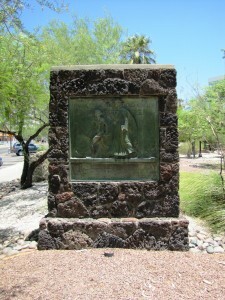 “Explorer, Historian, Rancher, Mission builder and Apostle to the Indians” states the inscription on the base to summarize an entire life spent for God and for the Pima Indians. Eusebio was born in Segno, in the Val di Non near Trent on August 10th, 1645, son of Francesco and Margherita. 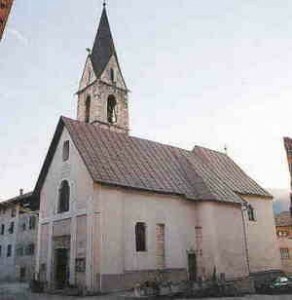 He was then baptized in the church of Torra, a village close to Segno. After his primary education he began his classical studies at the Jesuit High School in Trent, completing them in Hall (Tyrol). There, he became seriously ill, but he recovered miraculously through the intercession of St. Francis Xavier. The statue of Padre Kino in the Hall of Statuary in the Capitol Building of Washington D.C.
Then, deciding to enter the Society of Jesus, he vowed to dedicate his life to the missions of India, following the previous example of his cousin Martino Martini, another renowned son of Trent. 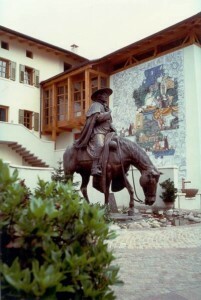 In 1677, at Eichstatt in Bavaria, he was ordained a priest . He completed his preparation for the foreign missions in Spain at the Jesuit College in Seville. Eventually on May 3, 1681, he arrived in Mexico (New Spain) disembarking at the port of Vera Cruz after a three month voyage across the Atlantic. At this time Eusebio Francesco Chini was 36 years old. He reverted to the German spelling of his name to avoid being misidentified as a Chinese national. His skills as a mathematician and cartographer made him an ideal candidate to join a new expedition to colonize the Californias. The expedition finally failed, however, and Kino was reassigned to the missions of the mainland. 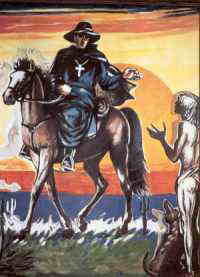 Then, on March 13, 1687 Padre Kino set out on his life’s greatest adventure — the evangelization of the heathen people of the Pimería Alta, modern Sonora and Arizona. states of Sonora and Arizona. He was at the same time a man of God and a defender of the Indians. Placed between God and Creation, he was pioneer-explorer, historiographer, cartographer, cowboy, rancher, and peacemaker. He taught the Indians how to cultivate fruits and vegetables unknown in those lands; he introduced cattle breeding, carpentry, and iron working. He valiantly protected the dignity and interests of his Indian neophytes against the overbearing schemes of the Spanish hacendados. Fearlessly, he enforced a royal decree that exempted converted Indians from hard labor in the mines and from the paying of tribute. He fashioned a whole new economy in the harsh, sun-baked land. He conducted several expeditions to the northwest as far as the Rio Colorado, providing scientific proof that California was indeed a peninsula. 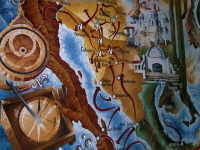 Even a rough estimate of his desert travels with herds of horses and cattle amounts to 12,800 km.! A truly gigantic enterprise, whose fruits were souls led to God, a new life for the desert, and a distinguished recognition of Indian dignity and worth. He died at midnight, March 15, 1711, in the village of Magdalena. He died as he had lived “in peace and poverty on the edge of something even greater.” Today Magdalena honors the memory of Padre Kino with a pilgrimage that has included admirers from Sonora, Arizona, Sinaloa, Chihuahua and the Californias for nearly three hundred years. Although the pilgrims are nominally devoted to St. Francis Xavier, Kino’s own patron, their zeal has transformed the devotion into a mutual homage to the Apostle of the Indies and the Apostle of the Pimas. Xavier and Kino are one in spirit. The great and deeply popular devotion handed down for generations received scientific corroboration at the beginning of the last century, when the diaries of Padre Kino “The Celestial Favours of Jesus and Mary Most Holy” were discovered in the archives of Mexico City. They tell the story of his missionary life, of the many difficulties encountered on his tireless explorations, and of the visions he had for the future of the Pimería. From its pages emerges a gigantic human character moved by love and compassion, a man who left an indelible mark on the history of the Americas. To honour him, work to find his burial place began in 1965 and continued relentlessly until May 19, 1966, when Kino’s grave was located in the city of Magdalena, Sonora. Four years later the Mexican federal government built the mausoleum over the site of his burial and transformed the plaza into an impressive monument that was dedicated on May 2, 1971, in the presence of Mexico’s President, Luis Echeverría. The Archidiocese of Hermosillo has officially opened the cause for Kino’ s beatification which is gathering evidence of the heroic sanctity of Padre Kino. 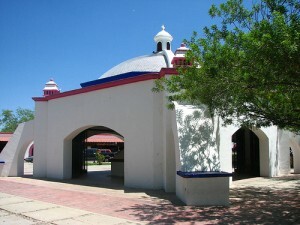 During the religious persecutions carried out under General Calles after World War I Kino was named “protector” of the State of Sonora. From the speech of John Paul II on April 29, 1995 in Trent: “I remember therefore among many other missionaries, men and women, who during centuries have left this region to go every where in the world. Among them it is only fitting to mention the Jesuits Martino Martini and Eusebio Francesco Chini.”.